Mockingbirds are by far one of the noisiest and most possessive birds in this country. They hoard the birdseed in feeders, and they attack anyone or anything that gets close to their nest. There are essentially four ways to repel mockingbirds, and sadly, most other species of birds as well. Depending on what birds are unwelcome, only one method may work. If the mockingbird is the only real concern, there is nothing you can do other than chase after it with a broom or super-soaker. 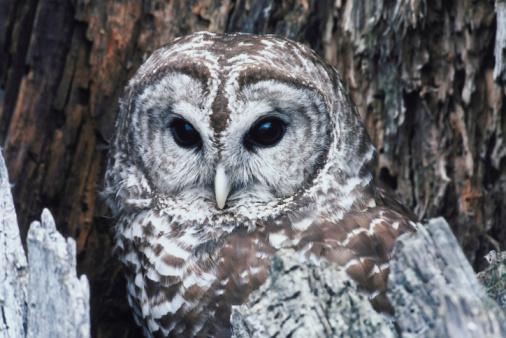 Other methods of repelling birds include loud sounds, like a shotgun, and stuffed or silhouetted owls and/or hawks. Fill the super-soaker water gun with water. Attach the scope for a better shot. Shoot all mockingbirds that come into sight. Trace the stencil with the white chalk onto the black paper. Cut around the outline of the owl or hawk. Tape or glue the sillohuette to the end of the dowel rod. Stick the dowel rod into the ground in the middle of the garden or crop as well as other strategic locations around the area you do not want mockingbirds.